Mack Trucks will continue to sponsor the American Trucking Associations (ATA) Share the Road program in 2019. Mack has sponsored Share the Road since 2001. The drivers travel countrywide in a 2018 Mack Anthem 70-inch Stand Up Sleeper model teaching the public about truck stopping distances and how it differs from passenger cars, potential truck blind spots while discussing other safety considerations that can help ensure safe travels. 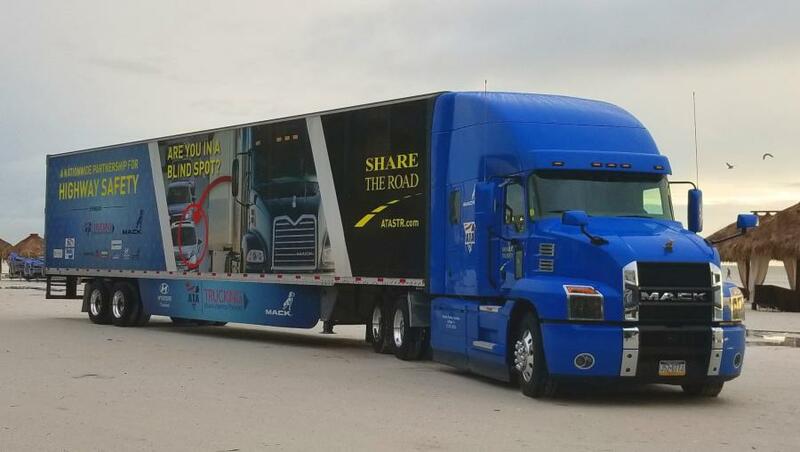 Mack Trucks will continue to sponsor the American Trucking Association's (ATA) Share the Road program in 2019. Mack has sponsored Share the Road since 2001. "Mack remains focused on highway safety, and we fully support the powerful message that the Share the Road drivers relay to the general public about operating safely around large trucks," said Jonathan Randall, senior vice president of sales and marketing of Mack Trucks North America. "We incorporated many safety features into the design of the Mack Anthem, which the Share the Road drivers utilize to deliver their messages to millions of people across the country." Professional truck drivers present live safety exhibitions for students, media and policy makers, demonstrating how to drive safely alongside semi-trucks through the Share the Road program. Each driver in the program has an outstanding driving record, including many with one million or more accident-free miles. The drivers travel throughout the country in a 2018 Mack Anthem 70-inch Stand Up Sleeper model teaching the public about truck stopping distances and how that differs from passenger cars, plus potential truck blind spots while also discussing other safety considerations that can help ensure safe travels. The 2018 Mack Anthem model donated to the Share the Road program is equipped with the 13-liter Mack MP8 505C engine with 505 hp and 1,860 lb.-ft. of torque and the 12-speed Mack mDRIVE automated manual transmission, which allows drivers to focus on the road ahead rather than shifting gears. The Mack mDRIVE is standard on all Mack Anthem models. The Share the Road Anthem also has Mack Road Stability Advantage by Bendix and Bendix Wingman Fusion. Road Stability Advantage is a fully electronic stability control system that helps reduce the risk of rollover and jackknife accidents. Bendix Wingman Fusion, a camera- and radar-based system, provides collision mitigation, adaptive cruise control and lane departure warning capabilities. Both systems are standard on all Mack Anthem models. The Anthem is available in several configurations, including a Day Cab, a 48-inch Flat Top Sleeper and a 70-inch Stand Up Sleeper.